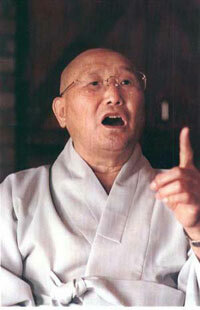 Zen Master Seung Sahn, our founding teacher, with his stick, used to poke us right here (pointing the stick at navel). He'd poke us and say, "Make your center Stronger....Stronger! Stronger! You must believe in yourself 100%!" But what does that mean, believe in yourself? Make your center stronger and believe in your own true nature 100%. Not your idea of who you think you are. But that who you are, before the concept of yourself even arises. What I am talking about is that we make a self concept, "I am this, or I am that." Then we want everybody else to believe that, so we spend our lives convincing ourselves and others that "I am this and I am that." But maybe I am not really that. And in that trying to convince, I get farther and farther and farther away from that true nature. Our Zen practice is so simple: Sit down, bring your attention to your lower abdomen, then watch. Then watch your experience. Don't push anything away. Don't grasp at anything. Observe. What we do when we lose contact is we go up into our heads. In our heads, we try to figure things out and try to understand things. We try to find a way to make sense of things, and what we hope to do is to find our balance. But what I am suggesting is we're finding our balance in the wrong place. Because if we go into our heads, we go into concept, and we go into understanding. We just take what we believe and know and try to find some way to make ourselves feel better. In that process, we totally lose connection to what actually is going on in the moment. Zen Master Seung Sahn, our founding teacher, with his stick, used to poke us right here (pointing stick at navel). He'd poke us and say, "Make your center Stronger....Stronger! Stronger! You must believe in yourself 100%!" As I said, our Zen practice is so simple: Sit down, bring your attention to your lower abdomen, then watch. Then watch your experience. Don't push anything away. Don't grasp at anything. Observe.